Play one or more cards of the same colour to beat the previous play. Don't get too excited and forget to refill your hand! If you fail to defend your pyramid, you must poke a bucket of that colour off and lose any bucket that falls with it. A fantastic blend of simple card game and dexterity all in a beautifully produced package. I was recommended this in store and I'm so glad I bought it. I had a family holiday coming up and was looking for simple fun games that could play up to 6 people. This has certainly ticked all the boxes! 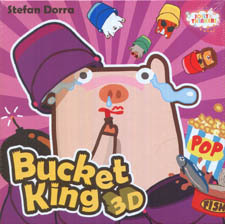 Players receive an allotment of small coloured buckets in 5 different colours which they stack in a pyramid however they wish to. They also receive a hand of cards in the 5 coloured sets. On a turn a player plays a numbered coloured card(s) down and the following player has to beat that number in that colour by playing one or more cards. If they can then play keeps going round until someone can't. That player has to flick or prod using one finger a bucket of that colour from their stack! If they don't have any of that colour then any bucket can be removed. The game finishes when one player is eliminated, the player with the most buckets left wins! This game is a lot of fun, can be grasped and taught very easily and even with 6 players probably only lasts half an hour. Awesome.